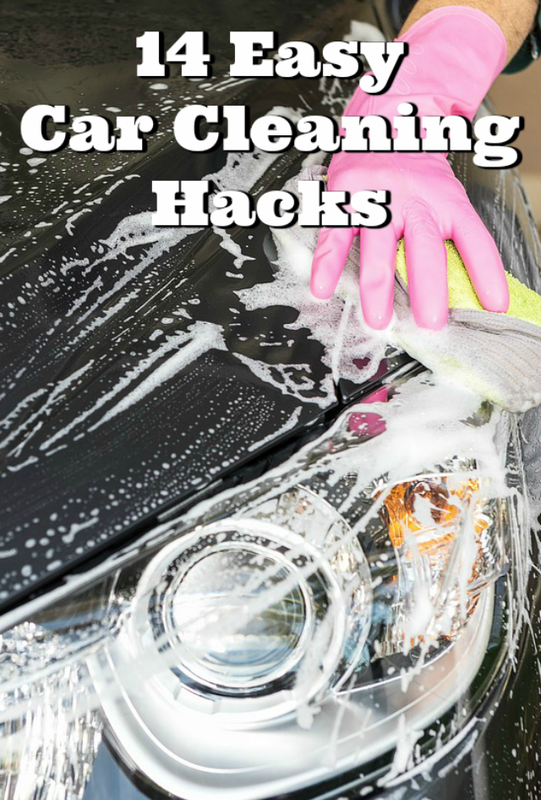 These 14 Easy Car Cleaning Hacks will help you get your car cleaned in no time with items you probably already have in your kitchen pantry! 1. Bring your makeup brush out to the car. Your air vents can get pretty dusty. Before turning on the air again, use a big fluffy makeup brush to get all that dust out of there. It doesn’t matter if this is an old used brush or a new one. If it is used, wash all of the makeup out before starting! You don’t want to have more to clean than when you started. 2. Squeegee that pet hair away. Taking your pets with you in the car can be fun, but the mess they leave behind is neither wanted or encouraged. But, they can’t help it, so instead of keeping your fur babies home, here’s a super easy car cleaning hack. Have a spray bottle with plain water in it. Mist the seat where the pet hair is. Don’t soak the seat. A little water goes a long way. Using a squeegee, run it over the upholstery. It will pull all the pet hair with it. 3. Keep the upholstery looking great. To do a deeper clean of your seats’ upholstery, make a paste out of vinegar and baking soda. scrub it into your upholstery and then rinse it out. It will take away dirt you didn’t even know was in there! It will also help with any weird smells, too! 4. Olive oil is great for your dashboard. 5. 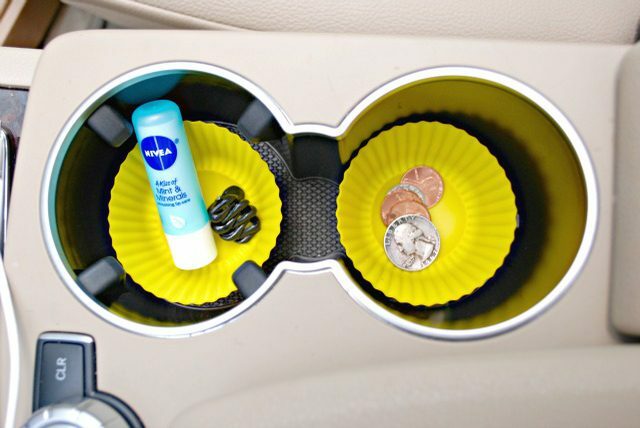 Cupcake liners fit right into your cupholders. This is a cleaning hack that will keep you out in the future. Once you’ve got your cup holders all cleaned out, put a silicone cupcake liner in them. The liners will gather any gunk and junk and the next time you go to clean the car, all you’ll have to do is take out the liners, shake them out, rinse, dry, and pop them back in! Easy peasy. 6. Mason jar + laundry scent balls = DIY air freshener! You know those bottle of laundry scent balls you can buy? You throw them in the dryer with your clothes. Here’s another use for them! Put 1/4 cup of the scent balls into a mason jar. For a lid, use something that has small holes in it. This way, the balls can’t come out of the jar, but their smell will keep your vehicle smelling nice and fresh. 7. Keep your used dryer sheets. 8. Conditioner with lanolin gives a great shine. After a good wash, get your vehicle all nice and shiny. This one might surprise you. Get a conditioner with lanolin in it. You heard me right! One of the best products to shine up your ride is probably already sitting right in your bathroom. 9. Grab your toothbrush and toothpaste. While you’re in the bathroom, you might as well grab your toothbrush and toothpaste for these hacks! When you get to cleaning your headlights, use some toothpaste on a rag. It will do wonders, making your lights crystal clear. And the toothbrush is for inside. When you really want to deep clean the inside of your vehicle, use a toothbrush to get into all the bumps, grooves, and crevasses. 10. Keep your wipers from smudging. When your done cleaning your windshield wipers, rub them down with rubbing alcohol. This will help prevent your wipers from leaving smears on your windshield the next time you go to use them. If you like these car cleaning tips, check out some other amazing ideas that will help you get your windshield clean on snow days and other fun car cleaning tips! Ever wake up to find your car’s windshield frozen over? 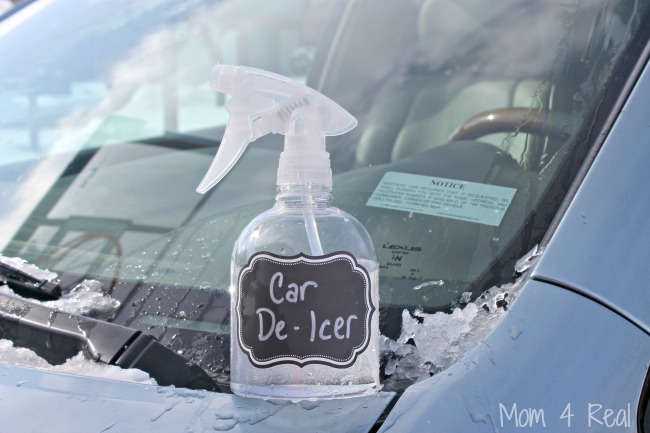 With my 2 Ingredient Homemade Car De-Icer Spray, there is no need to heat your car up to melt that ice. This amazing 2 ingredient mix will clean your windshield in seconds! Want to get the inside of your car clean? 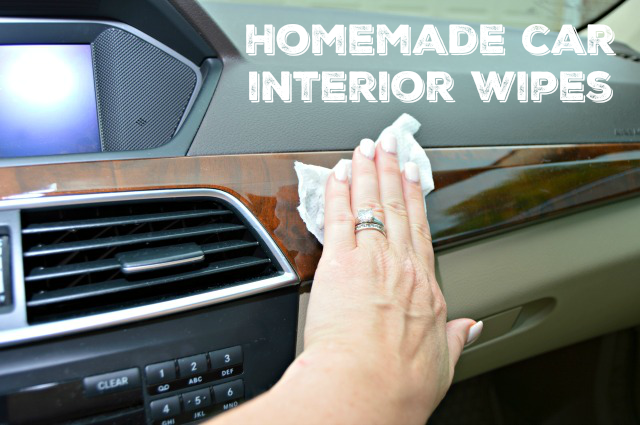 Make these Homemade Car Interior Wipes for a nice way to get your car clean without chemicals! Got a dirty windshield? No need to head to the car wash to get your windshield absolutely spotless and streak free! 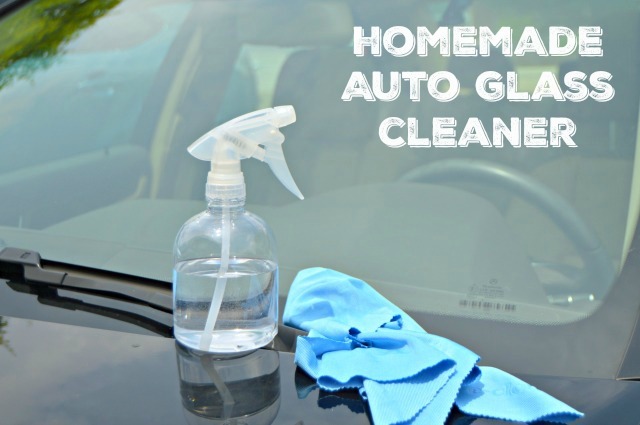 Just make my Homemade Auto Glass Cleaner…it cleans like nothing I’ve ever seen and dries quickly too! Want to get your car organized? 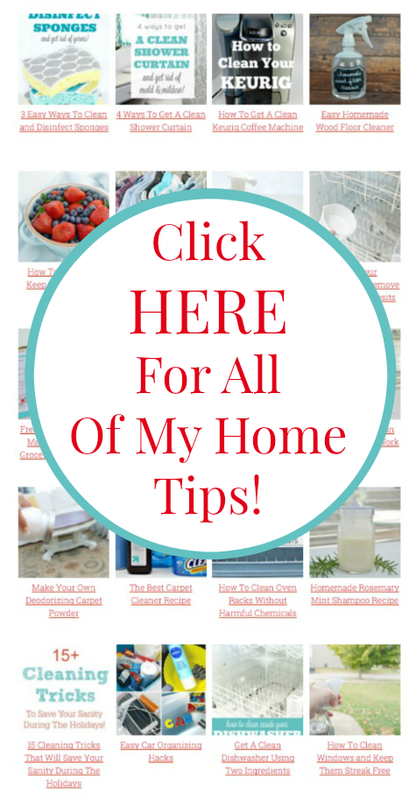 Check out my tips on How To Organize Your Family Car and cut the clutter for good! I’ve been looking for a formula that will make a good cleaning solution for the vinyl parts of the car interior such as the inside door panels etc. At the bottom of my car’s doors are some black marks from shoes, helping to complete the door opening or to hold the door open while we get out. What type of toothpaste do you recommend to clean your car’s headlights? Gel or “plain”? I find that plain white toothpaste seems to work best. In the Homemade Car Interior Wipes post, there’a no quantity for the ingredients, and I can’t tell from the picture. Is it water or vinegar in the cup? What are the other ingredients and how much do you use? Great article!! Just some additional information, if you wish to keep your fibre dashboard clean, you could dab in some kerosene on a cloth and wipe the dashboard. This will add some great shine to the dashboard and will also wipe away the grime from the crevices of the dashboard.DRM Motors is one such service centre that can assist you in getting the cleaning done. Their service centre provides end to end services in terms of painting, polishing, repairing modifying, and maintaining the vehicle. Their experts do a fine job and thus have many satisfied customers.